Enter into a realm of healthier, younger looking skin. 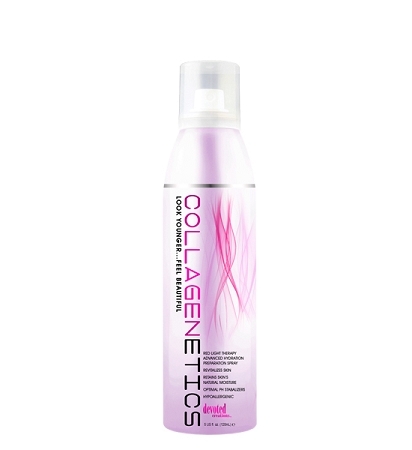 Collagenetics is a miracle break- through, total face and body skin care system. These formulas have been scientifically designed to help erase the appearance of aging by reducing fine lines, wrinkles and take your skin back to its youthful look. This fragrance free clear spray will revitalize the skin and help it to maintain its ideal levels of natural moisture. Hypoallergenic, it is designed even for those with sensitive skin. Spray on entire body following exfoliation as part of your daily skin care regime. For best results, use as part of a 4 step system.